Portuguese Marano; representative of and attorney for his Portuguese coreligionists; died about 1541. He was a skilful diplomat but a weak character, and undertook a dubious rôle. He filled various military posts, and so distinguished himself by bravery in the African war, in which he lost an eye, that he gained the confidence of King John III., who employed him in state business. He was entrusted with a diplomatic mission, and just before his departure was decorated with the Order of Christ. Instead of going to the post to which he had been accredited, however, Duarte went to Rome, where he displayed extraordinary activity in the interests of the Neo-Christians. His fiery eloquence and the lavish gifts with which he was plentifully supplied, won the support of most of the cardinals. On Oct. 17, 1532, Clement VII. annulled the bull of Dec. 17, 1531, relating to the introduction of the Inquisition, and he abrogated it entirely by the bull of pardon April 7, 1533. While Duarte was in secret correspondence with John III., whose interests he was ostensibly guarding, he was really acting in behalf of the Neo-Christians, who placed large sums at his disposal. He incurred the displeasure of the king to such an extent, however, that John ordered his ambassador at Rome to deprive Duarte of his decoration. When, at Duarte's instance, Pope Paul III. issued the bull of Oct. 12, 1535, which interdicted any examination of the faith of the Neo-Christians and the confiscation of their property, and in general forbade all inquisitorial proceedings against them, John, finding his plans thwarted by Duarte, tried to have him put out of the way. One evening toward the end of January, 1536, Duarte was attacked by masked men on the street, and was left for dead with fourteen wounds. The armor which he wore under his clothing, however, saved his life. He was carried to the house of Philip Estrozi, and later, by order of the pope, was taken to the convent of S. Angelo, where he was carefully nursed back to health. It was said by well-informed persons that the assassins had been hired by the king; and Duarte himself wished to prove this in court. 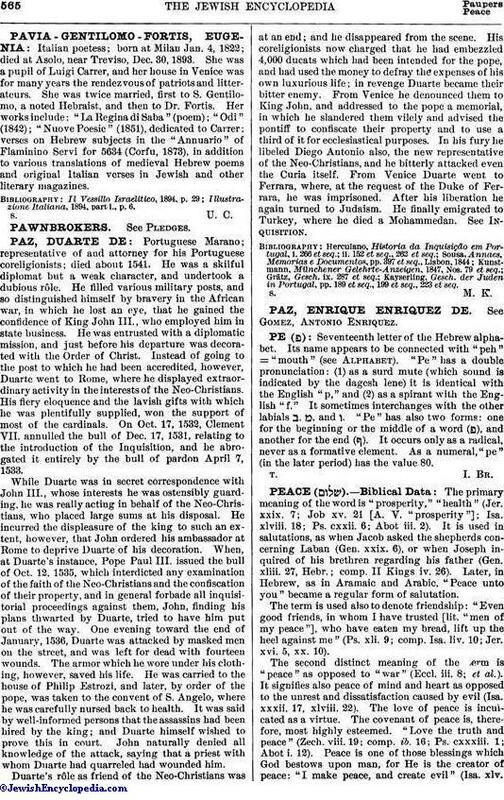 John naturally denied all knowledge of the attack, saying that a priest with whom Duarte had quarreled had wounded him. Duarte's rôle as friend of the Neo-Christians was at an end; and he disappeared from the scene. His coreligionists now charged that he had embezzled 4,000 ducats which had been intended for the pope, and had used the money to defray the expenses of his own luxurious life; in revenge Duarte became their bitter enemy. From Venice he denounced them to King John, and addressed to the pope a memorial, in which he slandered them vilely and advised the pontiff to confiscate their property and to use a third of it for ecclesiastical purposes. In his fury he libeled Diego Antonio also, the new representative of the Neo-Christians, and he bitterly attacked even the Curia itself. From Venice Duarte went to Ferrara, where, at the request of the Duke of Ferrara, he was imprisoned. After his liberation he again turned to Judaism. He finally emigrated to Turkey, where he died a Mohammedan. See Inquisition. Kayserling, Gesch. der Juden in Portugal, pp. 189 et seq., 199 et seq., 223 et seq.